I’ll call her Farrah. And her husband Franz. They were Holocaust survivors who spent a lifetime trying to recover from the unrecoverable. They were now too old to stay in their home any longer and were living with their daughter and her family. Their house was to be sold, so its contents had to be reviewed, sorted and mostly given away. Some of it would be saved, but most of it was scheduled to be picked up by a Vietnam Veterans of America truck. Their family did not want to upset Farrah and Franz, so they didn’t let them know that their house was being cleared out. It was for their own benefit. Why cause them any unnecessary pain? Hadn’t they been through enough? The first two days, the family went through the house and divided up those cherished possessions they wanted to keep in the family for themselves and their children. The next two days were spent separating the junk from the items to be donated. Each member of the family was assigned a room to clean out. For hours, Farrah and Franz’s family stuffed trash bags with old clothes, pots and pans, towels, knickknacks, cleaning products and various other household items. Tess thought about her own home and how disregarded she would feel if anyone—even her immediate family—rummaged through her venerated possessions, and made decisions about her life’s accumulations. When Tess entered the bedroom, the dresser drawers were mostly empty, but for some sachet, hotel soap, and handkerchiefs. The bed was already stripped. Just a bare mattress and the frame were left. On the lone chair, there was an old wool blanket. It was small and worn. It was drab, almost colorless, and itchy. Tess was allergic to wool, so she carefully picked it up with her right thumb and pointer finger. She dropped it into the garbage bag, looked around, and closed the bedroom door behind her. As Tess roamed around the house, surrounded by Farrah and Franz’s belongings, she felt their spirit, and she got to know them in ways she hadn’t before. Beautiful beveled mirrors and rolled up Oriental rugs earmarked for family members, Sabbath candlesticks, a spice box full of aromatic cloves, and on and on and on. Tess was given permission to take the spice box and wondered if one day someone would take it from her in the same manner. The trash was put out in piles on the sidewalk. A mound of black garbage bags was now the only proof that someone had lived and loved there. The next day Tess received a call at work from Farrah’s daughter, asking if she had seen a blanket. Farrah now knew that her house had been picked through and she was furious and insisted on someone taking her home. She was adamant about saving her belongings. But mostly, Farrah wanted her blanket. Tess was informed that it had tremendous sentimental value, and Farrah was beside herself over the loss of it. Tess was horrified and told Farrah’s daughter that she had thrown the blanket away. It hadn’t looked like anything worth saving. It looked old and ratty. She apologized profusely, but the damage was done. The blanket was gone. Farrah accused her daughter of throwing it out. She accused her son of throwing the blanket out as well. She never accused Tess, because she told her daughter and her son that Tess would have never thrown out her treasured blanket. In fact, Farrah had convinced herself that Tess was not even there. Tess felt disgustingly callous and stupid for being involved in the first place. All the family members told her not to worry and to stop taking it so hard. They assured Tess that Farrah would get over it soon enough. The following weekend Tess visited Farrah, who railed against the family for what had been done. Her house had been violated, her belongings destroyed, and her revered blanket thrown away by some idiot. Tess wanted to confess to Farrah that she was the idiot. She wanted to beg for her forgiveness and get some kind of absolution from her. But Tess didn’t ask. And she couldn’t tell. So Tess kept her cowardly mouth shut. But she did ask Farrah why the blanket meant so much to her. And this is what Farrah told her. Tess was listening at the edge of her seat and with intense interest, but she wasn’t sure how this frightening story related to the blanket. That night we hid in our apartment and heard a lot of noise outside. Around midnight, we looked through our windows and saw Nazis marching in the streets yelling “Deutschland erwache! Judah verrecke!” which meant, “Germany awake! Judah perish.” During this night most of the Austrian non-Jews, including our non-Jewish neighbors became Nazis. The situation after that became more ominous and dangerous for all of us Jews. The Nazis would round up Jews in the streets and send them to the police, first for interrogation, and then to concentration camps. Unbeknownst to us, we already had concentration camps in Austria. But what we did know was that it was time to leave Vienna. I was told by other Jews planning their escape that the best way to get out would be via the Westbahnhof railway station in Vienna, where we could get a train that went west into Germany, and then on to Luxembourg. Luxembourg is a tiny country which borders on Germany to the east. Its northern border is Belgium, and the rest of Luxembourg is surrounded by France. The rumor was that the easiest border to cross was Luxembourg. All of the other Austrian and German borders were pretty much sealed. Crazy as it sounds, going from Austria into the Nazi heartland of Germany was the best way to get out, although it was extremely dangerous. But anything was better than waiting for the Nazis to get us Jews in Austria. It was now the beginning of September, and the borders between France and Germany were mobilized by a lot of troops on both sides. I tried to convince my parents to come with me, but they wanted to stay in Vienna. They couldn’t make up their minds to leave their home and at an advanced age stray out into a strange country with all the risks of illegal border crossings. I asked my mother if I could take Ona, my 16-year-old sister, with me. I was 24 at the time. My mother was against it, fearing that we would be caught and sent to a concentration camp—or worse. But Ona wanted to come with me, and my parents finally gave in. Nervously wringing her hands together, Farrah breathed in deeply, and asked Tess for a glass of water, although she called it “vasser.” As she sipped slowly, she pressed on. We embraced our family for the last time and got on a train which rolled toward the German border. A few hours later, the train came to an abrupt stop. I looked at Ona fearfully and realized that I had made a huge mistake to bring her with me. She was shaking and whimpering. I severely told her to be quiet. Some Nazi police boarded the train and were walking through asking everyone for their papers. I handed Ona a train blanket and ordered her to put it right up to her face and pretend to sleep. No shaking or crying I harshly told her. She leaned her face against the train window and covered most of her face with the blanket. By this time the Nazi was a few seats away from us. He asked a dark-haired young woman for her papers. When she handed her passport to the Nazi, he opened it, looked with disgust at her, and then violently slapped her face with the back of his hand, her blood spattering against the window. He yelled to another Nazi, who grabbed her by the hair and dragged her off the train. Oh my God, Tess thought to herself. Farrah handed her sister Ona a train blanket. This was the blanket I found in Farrah’s bedroom—in some garbage dump by now! Tess started to cry, burying her face in her hands. Farrah stroked her hair and lovingly shushed her. Perhaps the same way she did for Ona. It was our turn now. The Nazi looked at me and he smiled widely. You see, I was beautiful and blonde with blue eyes. He thought I was Aryan. 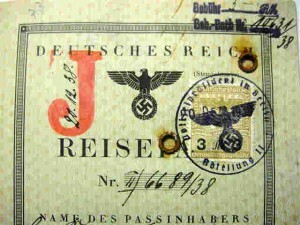 We had German passports, me and Ona. 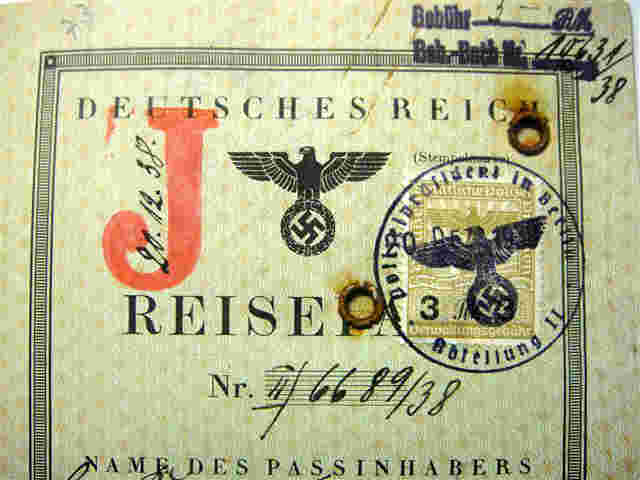 But they were stamped with a red J on the first page to mark the holder as a Jew. The Nazi looked me up and down sensually, and then at Ona, the blanket only covering part of her beautiful young face. She was also blonde, and more beautiful than me. I smiled flirtingly at him as he charmingly said, “Guten Nachmittag, Fräulein,” which means “Good afternoon miss.” “Guten Nachmittag,” I replied sweetly. And then he asked the dreaded question, but pleasantly and kindly: “Darf ich Ihre Papiere Fräulein?”which means “May I see your papers, miss?” I looked up at him warmly and handed him my passport while coquettishly replying, “natürlich lieber Herr” which means “Of course kind sir.” The Nazi, still smiling opened my passport, and he stared at it for only a second, but it seemed like an eternity. The smile disappeared from his face as his bright blue eyes looked intently into mine. I never stopped smiling. Then he turned his head toward Ona, who was shaking slightly under the blanket. And then he turned back to me. I was screaming inside but I never stopped smiling. And then you know what he did? Farrah’s hands were shaking, and Tess took hold of them firmly, to settle her down. Tears welled in Farrah’s still lovely sky blue eyes, but she didn’t cry. It was only Tess who whimpered softly. He looked again at Ona and then he carefully and gently closed my passport. “Danke Fräulein,” he murmured softly as he moved on to the next passenger. A close friend of mines father left Austria the day Hitler marched in.He had a wife and 2 children from a very rich family.The wife wouldn’t leave all her money and possessions and stayed with the kids,and were eventually murdered by the nazis.His Mother lived in the Sudetenland in Czechoslovakia.Her father sent her to what was then Palestine before the nazis marched in.She remembered her father telling her that there was no future for Jews there anymore.She joined the British Army and was a truck driver during the war.His parents met in Israel after the war and later emigrated here.His mom is 93 now and we just went to breakfast with her on Sunday.